Printed in the Interest of the Sick and Afflicted. 1/1, 1898-1903(?) 40 pp., probably free of charge. "By writing Prof. S.A. Weltmer, Nevada, Mo., you will receive the Magnetic Journal, 40-page illustrated magazine, and long list of the most remarkable cures ever performed." This was the advertising vehicle for Sidney A. Weltmer and his mental-healing sanitarium and school in Nevada, Missouri. It was replete with endorsements, advertisements for cures and courses in mental healing, and rapturous testimonials from cured patients (illustrated with before and after photographs), and was the companion to Weltmer’s more sedate Weltmer’s Magazine. 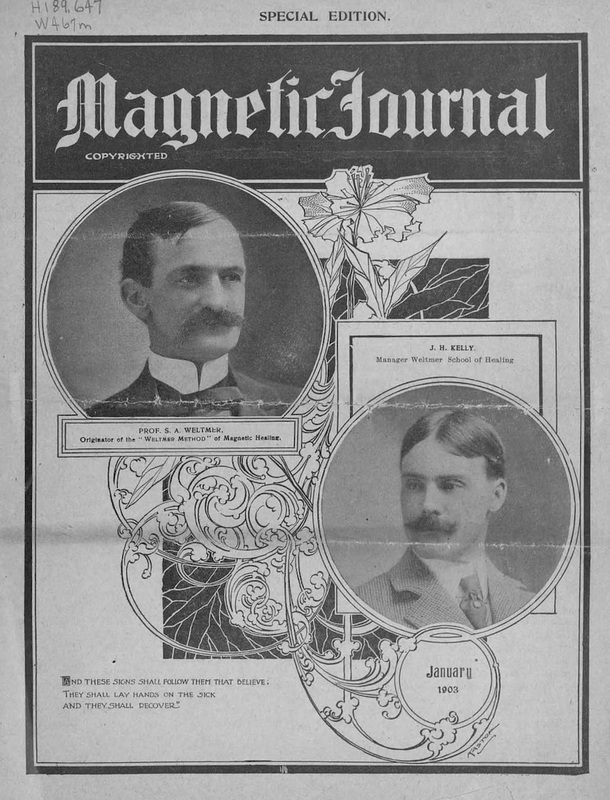 Selections from the journal were republished by Weltmer in 1899 as Weltmerisms, or, Pointed Paragraphs Related to Magnetic Healing. Crabtree 1446. The issue for January 1903 is in the Weltmer papers at the University of Missouri, Columbia.